A new twist on gingerbread houses! Haunted Halloween Houses are perfect for gift giving and decorating. A great project for kids and adults alike. Pre-baked gingerbread house kits are available at fancyflours.com. 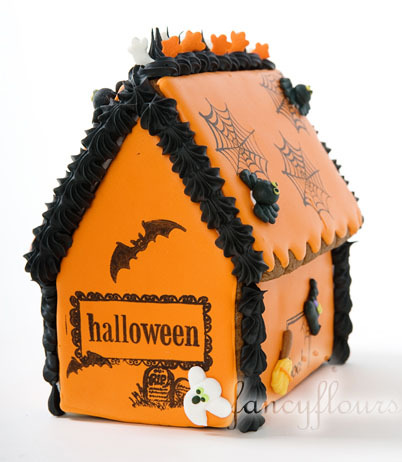 This haunted halloween house is decorated with orange royal icing, then finished with pre-made royal icing decorations and quins. Want to achieve the stamped spider-web and bat look? Purchase a rubber stamp in spider-web, bat and other halloween shapes. You will also need a non-inked ink pad. Use food coloring (black used here) to moisten the stamp pad. Dip your stamp into the pad and blot with paper towel. Stamp onto hardened royal icing surface just as you would stamp on paper, and let dry. Stamp onto cookie shapes before putting your house together for best results.